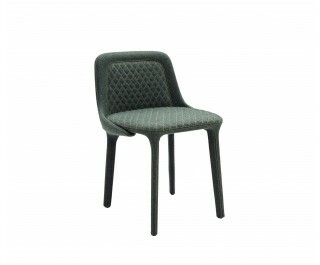 Lepel is a collection of padded chairs, fully upholstered in fabric or leather. The craftsmanship and the ability to customize the finish -from the fabrics used, the stitching at sight- makes this chair unique of its kind. Two different backrests for a single chair. Chair and armchair, both upholstered and covered with fabric, have the same aesthetic philosophy, optimizing the production of molds. “Lepel” means “spoon”in Afrikaans: this is the function of the two backrests, to contain and to support the seat like a spoon. The choice of this name is not accidental: the design studio of Luca Nichetto continues to push for a cultural melting pot with a team more and more international; Sweden, Italy, South Africa, Germany, France, England and the rest of the world were, are and will be part of this team, physically halfway between Venice and Stockholm.